We just released 2.1 of our Big Data solution designed for digital marketing OEM’s. 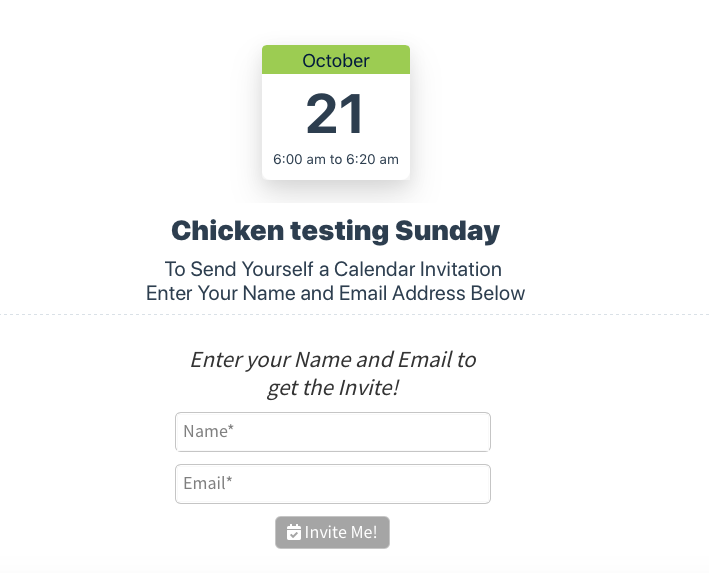 You can use it for free to create and promote your events by sending real calendar invites to track RSVP’s from your customer’s Google and Outlook calendar clients. Just create a calendar invite in your Google or Outlook calendar and invite us to your event with this email address: create@invitethis.com. 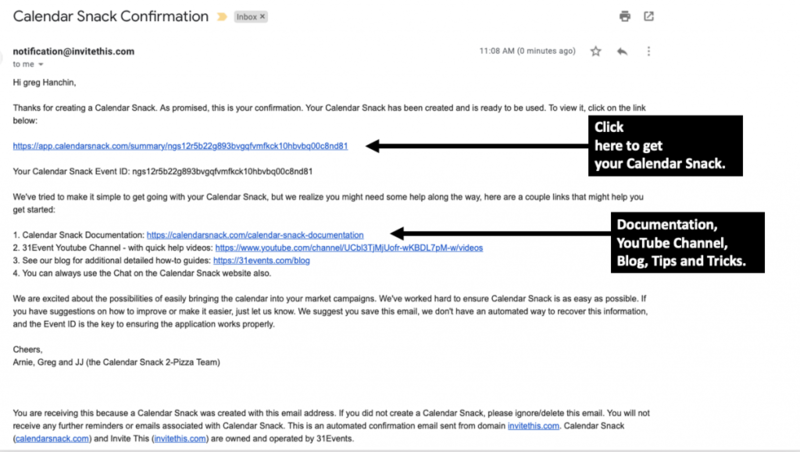 We will send you a CalendarSnack notification email with all the information needed to get started. 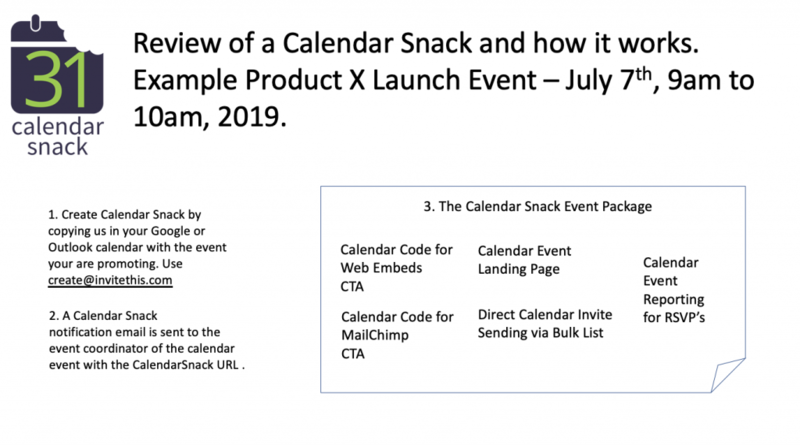 In 5 seconds I created a CalendarSnack and received the Calendar Code for Web Site Embeds, MailChimp Call to Action Embed, a Calendar Landing Sign up Page and instructions on how to send direct Calendar Invites for the event using a subscribe email address. 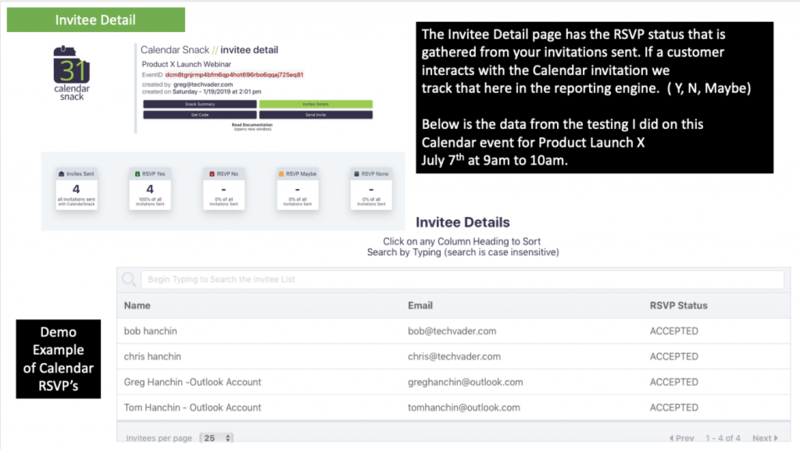 All of these sending options track Calendar Invite RSVP’s for the event in the CalendarSnack reporting engine. 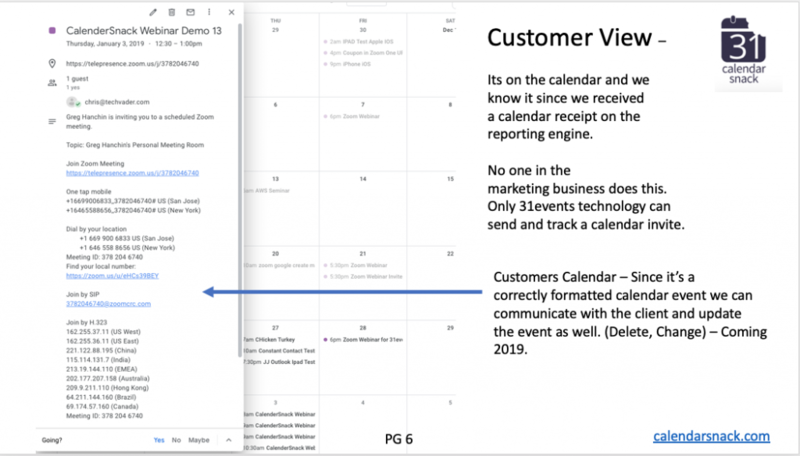 If you are an OEM and purchase the service provider edition you will have the ability to view the event analytics of the all the RSVP’s for the calendar events in your domain. We can customize this for your brand with whatever domain you want to use for RSVP communications. This is a completely headless and serverless design. All built on a AWS stack so we can get you up and running in 30 minutes in your AWS account. There are 100’s of use cases for OEM email marketing platforms and major brands using our technology. As of this blog posting there are 5 Billion mobile phones that have a calendar application onboard. That’s a lot of opportunity to promote and track RSVP’s for your events. You can get the PDF workbook version here for offline. Click Here. Data Analytics are collected within the domain of RSVP the service. In this example we are illustrating CalanderSnack.com data. This can be your own domain and web service if you wish for RSVP communications to your customers. Step 1 -Develop your Calendar Invite in Google Calendar or Outlook Calendar application of your choice for desktop, mobile or web app and invite us by adding us in your calendar client for your event. Step 2 — You will receive a confirmation email like below when you invite us with create@invitethis.com. 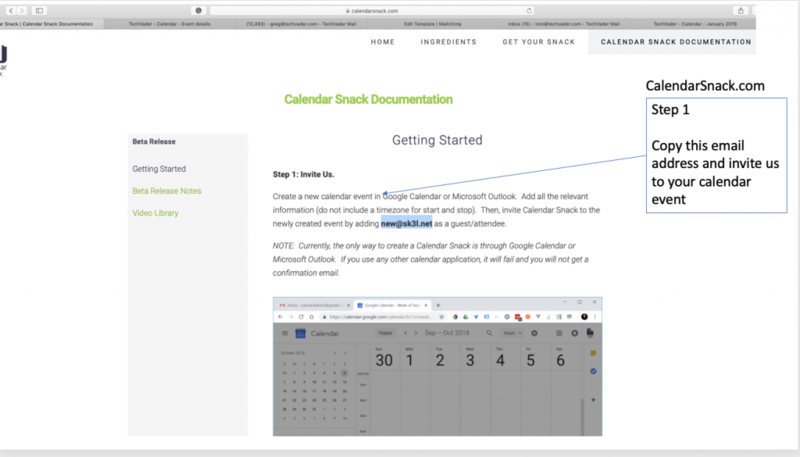 Click on the snack link to retrieve the CalendarSnack reporting page. Step 3- After clicking the CalendarSnack URL you will see your Calendar Snack Summary page. 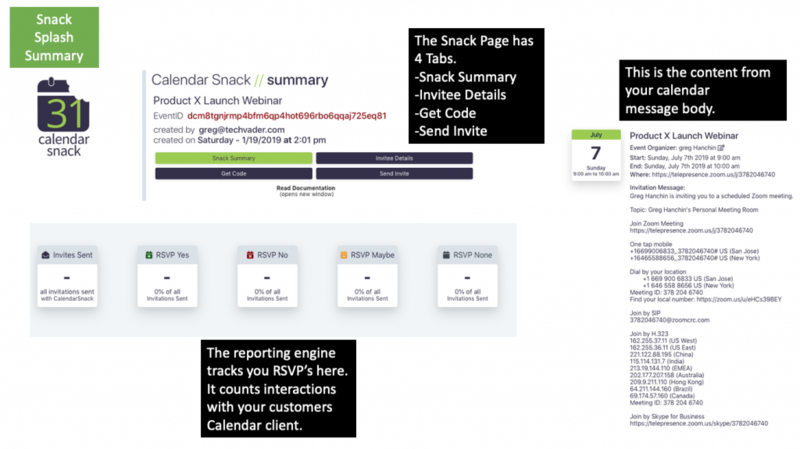 There are 4 primary buttons: Snack Summary, Invitee Details, Get Code, Send Invite. The Snack page lands in Snack Summary mode as seen below. 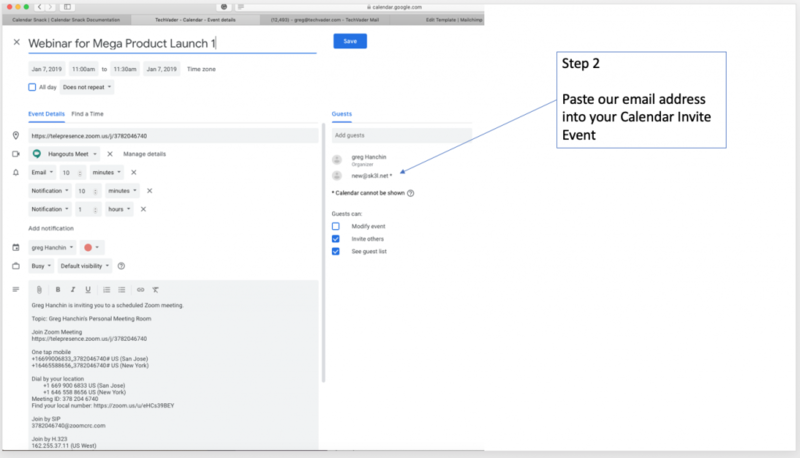 Step 4 — Click the Send Invite button for testing the calendar invitation prior to using the code generator for Web Modals in web pages or MailChimp code in a MailChimp Call to Action button in a campaign. You can place your test email address in here to see how it looks on your test account calendars. Step 5- Review of Send Invite function from the perspective of the calendar client. 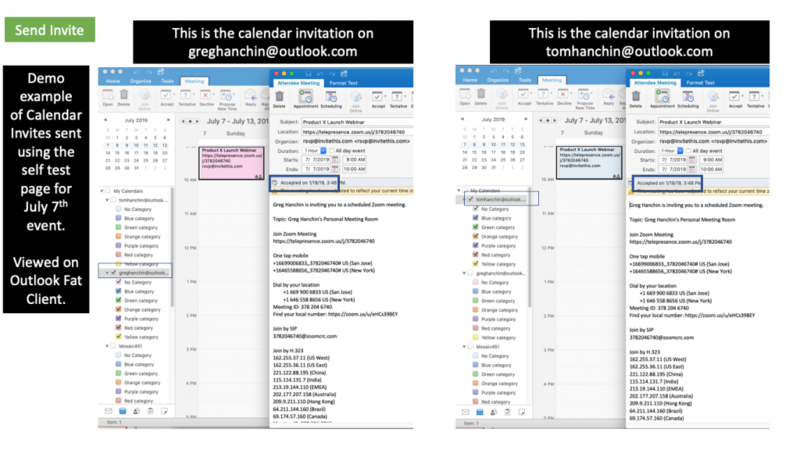 This first batch is showing Outlook compatibility for the July 7th Webinar and the ability to RSVP like a normal calendar invite. When your customer RSVP’s by selecting Yes, No or Maybe in the Calendar client interface we count that in the Calendar Snack reporting engine. You can try it with your test email address’s and see it show up in the RSVP counter. Step 6 — Review of Send Invite test function from the perspective of the calendar client. 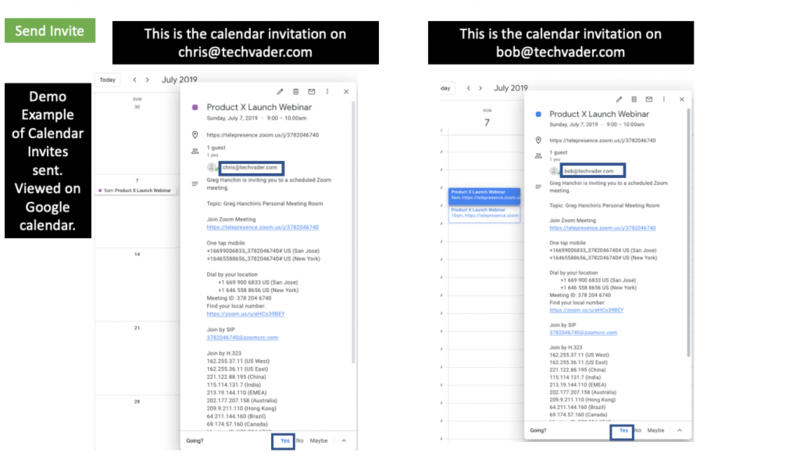 This second batch is showing Google Calendar client compatibility for the July 7th Webinar and the ability to RSVP like a normal calendar invite. When your customer RSVP’s by selecting Yes, No or Maybe in the Calendar client interface we count that in the CalendarSnack reporting engine. You can try it with your test email address’s and see it show up in the RSVP counter. 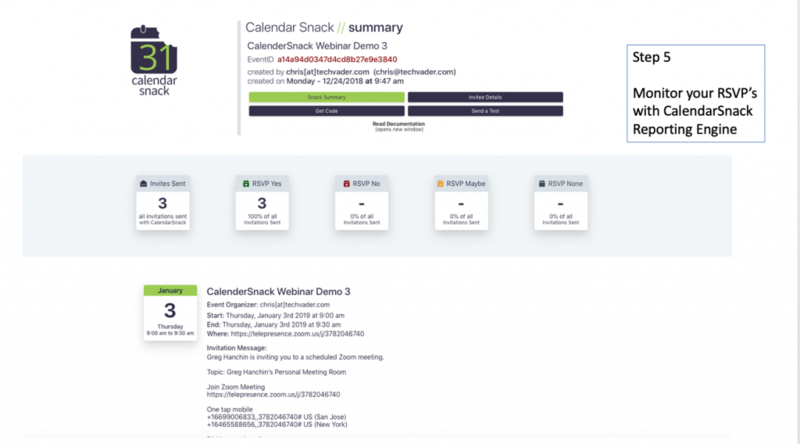 Step 7 — Review of the CalendarSnack reporting page. You can see in this Calendar Snack, 4 people have been sent a calendar invitation and 4 people have accepted the calendar invite onto their calendar. When someone accepts the invite onto the calendar, that event will use the notifications built into the calendar client on that device. Step 8 — This is a review of Email Box modal and Name plus Email Box modal that are prebuilt and can be used for quick embeds into any web pages by copying the code and placing into your website. When someone fills in their email address we send them the calendar invite for that event and track RSVP. Step 9 — This is a review of Full Event modal and the Quarter Size modal that are prebuilt and can be used for quick embeds into any web pages by copying the code and placing into your website. When someone fills in their email address we send them the calendar invite for that event and track RSVP. 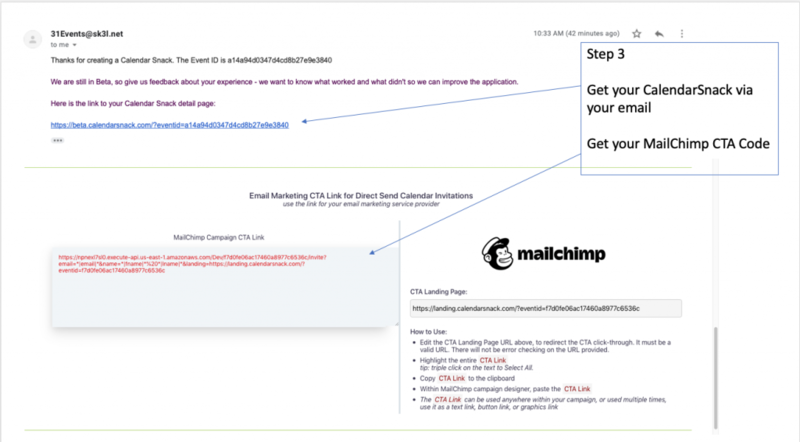 Step 10 — This is a review of the Email platform support of the Mail Chimp code generator for Call to Action embeds into graphics within a Mail Chimp campaign for RSVP tracking. 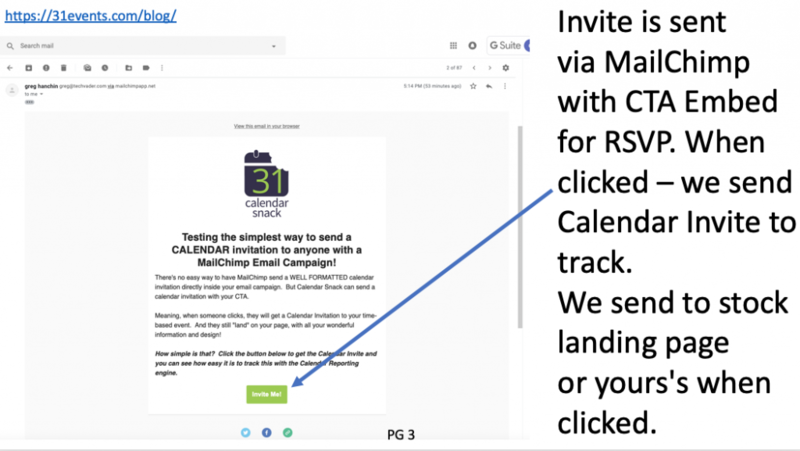 When the Call to action button is clicked in MailChimp email, we send a calendar invite to the email address that is resident in the MailChimp template and send them to our Splash page or one that you can provide in our template. 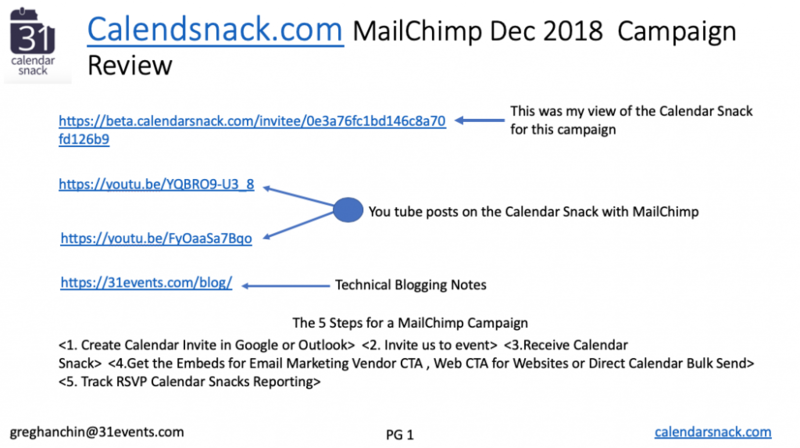 Step 11 — This is a review of the steps for the MailChimp embed in the sample MailChimp campaign. 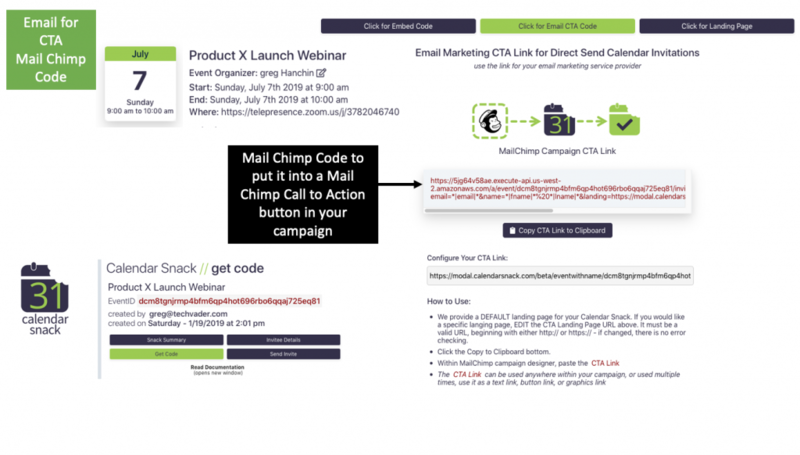 Once you get this down a couple times it takes less than 30 seconds to get the code and paste it into the Call to Action button in your MailChimp template. 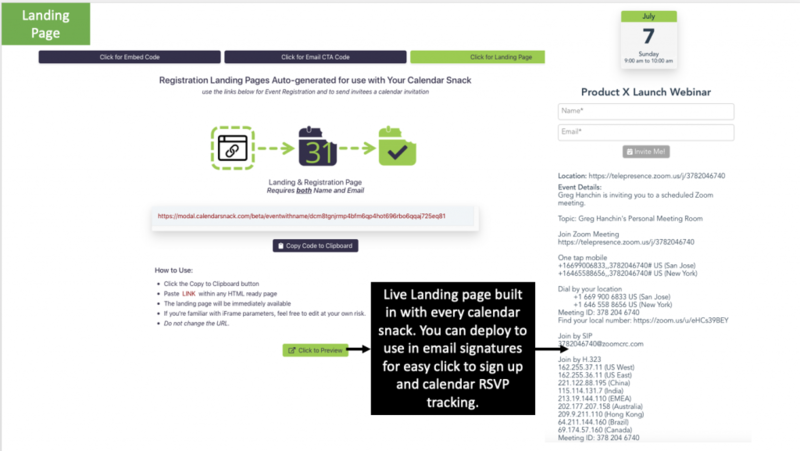 When a customer clicks on the CTA, they receive a real calendar invitation that we track for RSVP and get sent to a landing page of your choice. 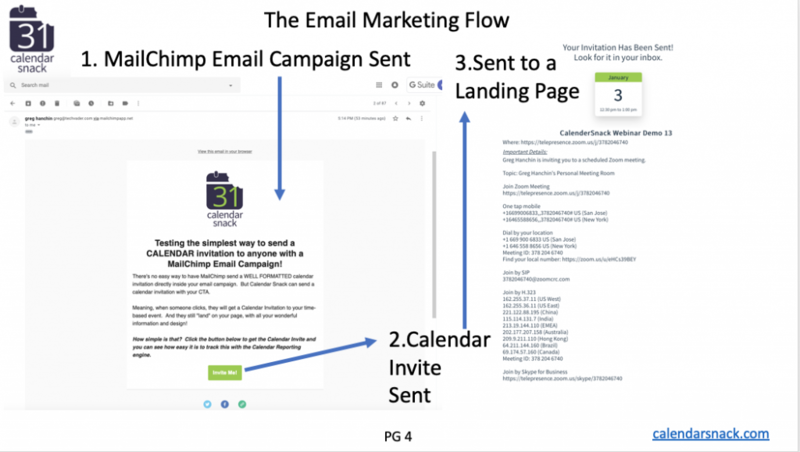 Step 12 — This is the overall work flow of what happens in the Mail Chimp Call to action button with the CalendarSnack solution. The same work flow applies with the generic email provider template. 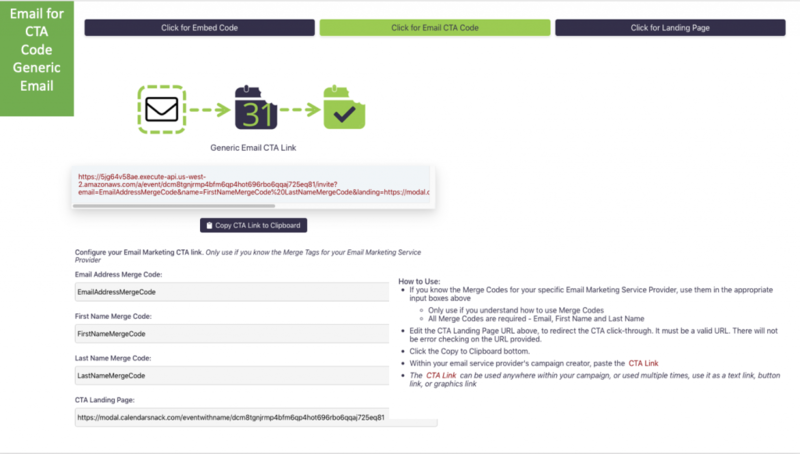 Step 13 —This is a review of the generic Email code generator for Call to Action embeds into graphics within an email campaign for RSVP tracking. 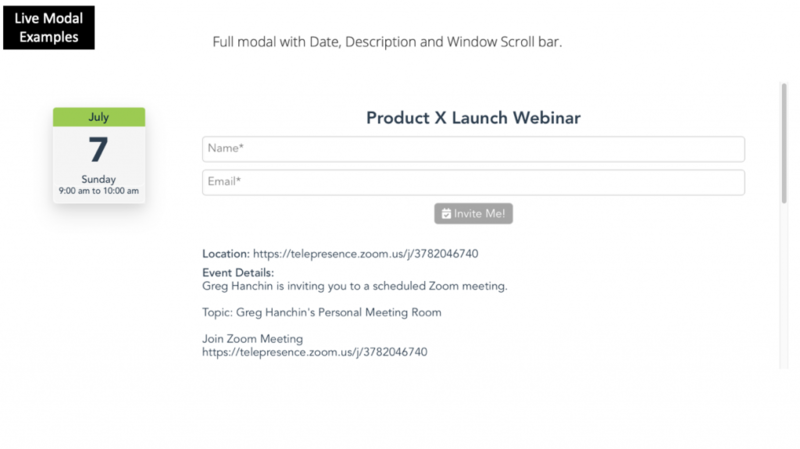 When the Call to action button is clicked in specific email provider setup in this template, we send a calendar invite to the email address that is resident in the email template and send them to our Splash page or one that you can provide in our template. This template is useful only if your email marketing provider supports mail merge codes and you know what they are. 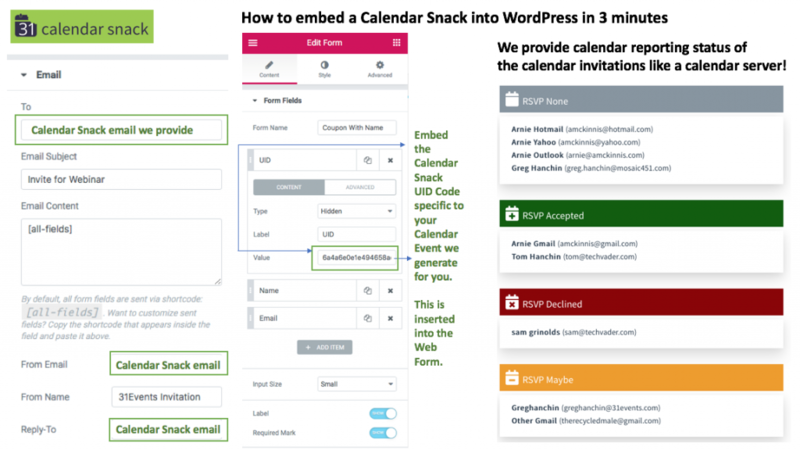 Step 14— Review of the CalendarSnack landing page. We include a landing page that is a URL that you can package up and use in email signatures or in emails, for ad hoc event signups. This is one of my personal favorites. In less than 5 seconds you can have something for event registration and tracking calendar invites for your prospects or customers. Step 15— Review of the Live 4 stock web embeds modals on the test site for the July 7th Webinar from 9am to 10am. Each of these modals took approximately 5 minutes to setup. The last one is the Landing Page URL that is generated for each Calendar Snack. Step 16 — The last item of the review is a newly introduced service we added called the direct calendar send option. It works by using a “bulk@invitethis.com” in the send to field of your email client. 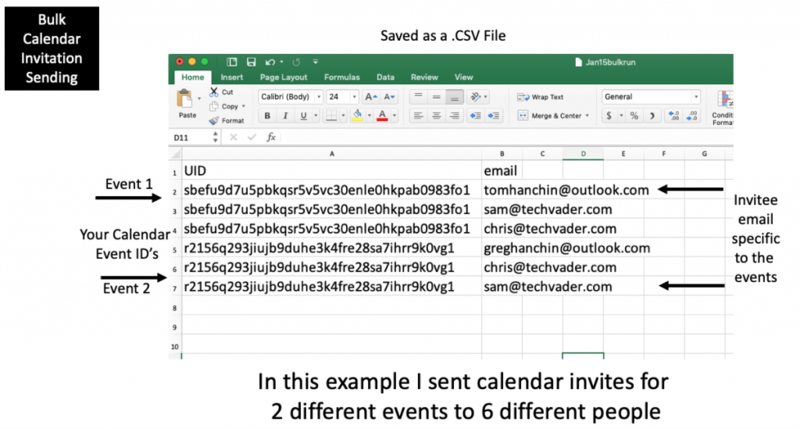 We support up to 50 email address per CSV file attached as a free service per event. Included in the CSV file is the Header “UID” and “Email Address”, then the corresponding data for each field. See example below. We will have a security token soon for those that want to use the service in alignment of opt-in list building for event management. The token will be issued for direct calendar event sending to large email lists for event promoters. In closing if you have any questions. We have drift bots running at 31events.com and calendarsnack.com. Thanks for stopping by and checking us out! As we wrap up the year we wanted to finish with a format we have been testing. Its a 1 Minute Video from our YouTube Channel, a detailed Screen Shot guide and a PDF Workbook for you. We are working on an OEM playbook and this should be completed in the next week. Happy New year! As we wrap us this year, we are getting ready to release our production product. 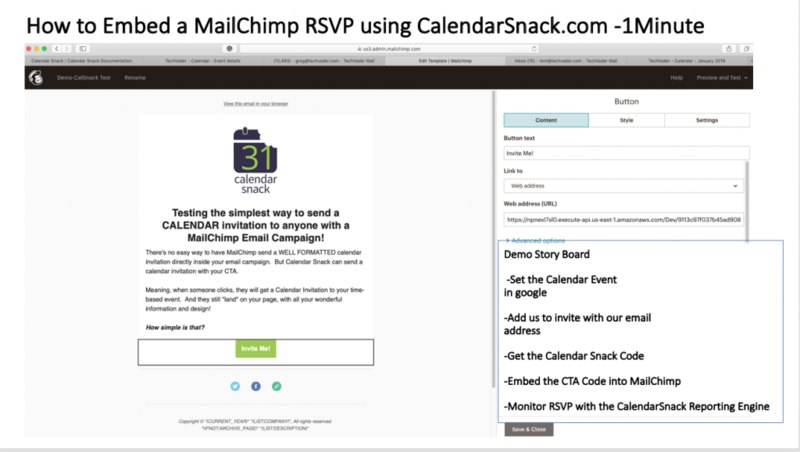 Here is a quick snap shot of our MailChimp RSVP calendar invite tracking. See steps here, along with video and PDF guide. Happy Holidays from the team here at 31events.com! 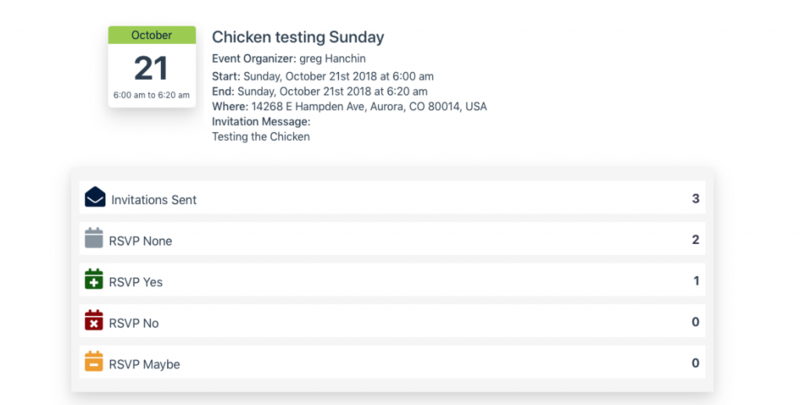 At 31events.com we develop messaging technology that enables the RSVP calendar interface within email clients to track the responses of the individual event. The technology can be used for all kinds of use cases for time-based events across vertical markets. This gives every marketer the ability to communicate directly with a customer’s calendar. 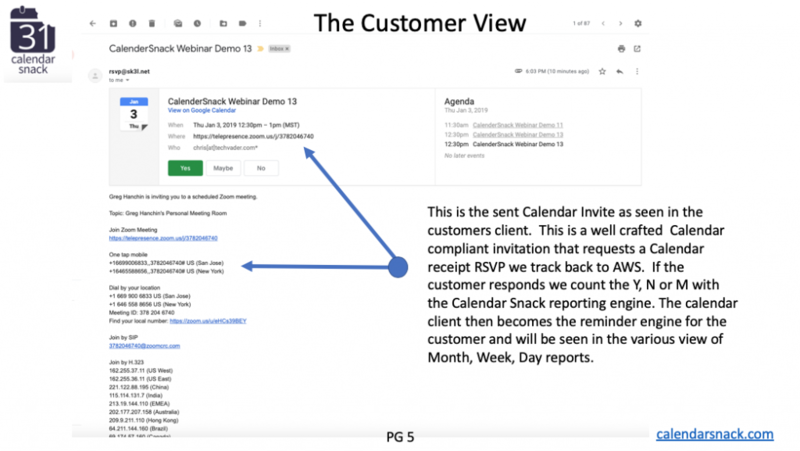 When a calendar invite is sent, it is correctly displayed in the message body to be read in the correct client format for webinars, promotions and attachments such as coupons. 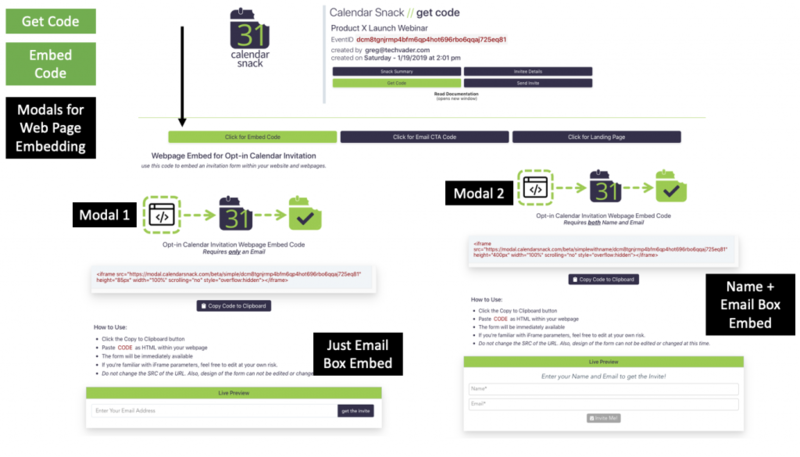 The Calendar Snack package has been designed for marketing agencies and software OEM’s that want to add value through the ability to send and track calendar invites in an easy way by integrating them into call to action campaigns with a managed service. 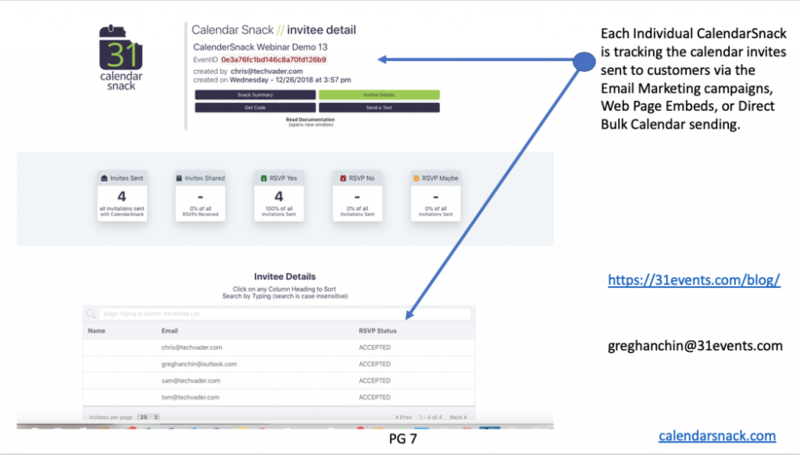 The web service supports calendar message building, message sending and RSVP’s return receipt reporting. The calendar invites can be emdedded into web pages and popular email packages like Mail Chimp using the code generator. The calendar invite data is available in a reporting interface for all RSVP’s providing granular details for your marketing campaigns. Example of the Event Summary. The components of the messaging solution are using Amazon Web Services S3, SES, Dynamo DB, SNS and API gateway to process the calendar invites with our custom developed proprietary Lambda functions. The solution design is “Headless”. This means you have no Create, Read, Update, and Delete or (CRUD) for the Calendar Invites. The customer sends you an calendar invite off their native calendar client to your branded domain email address. 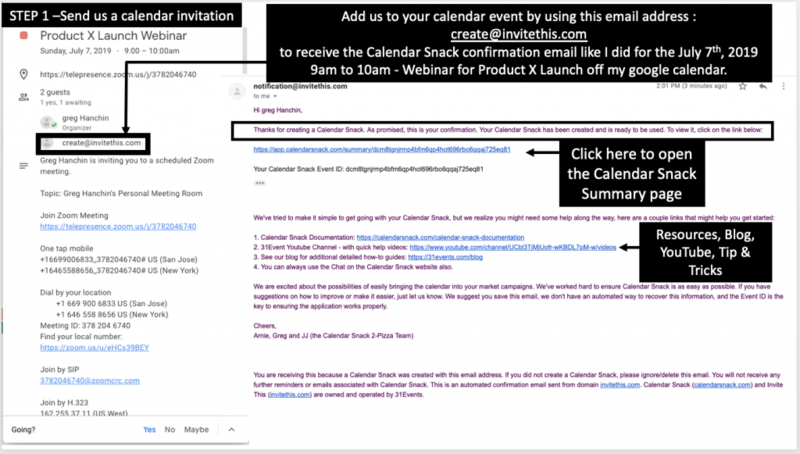 That message is sent to us and we re – generate a packaged calendar invite complete with instructions on how to use and test the calendar event with details of the code embed for web pages and email call to action embeds. 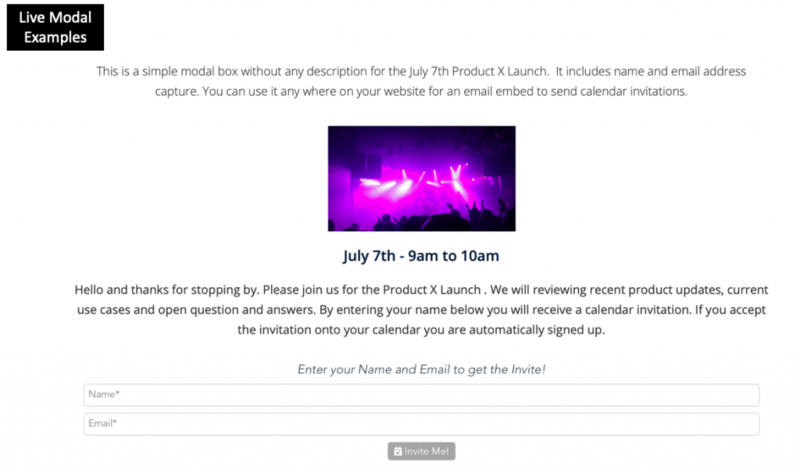 Once that process is complete – which just takes a few seconds to complete, we sent a confirmation email to the event organizer from the Calendar Invitation with all the details. Example of the event confirmation email once the customer sent us a Calendar Invite below. 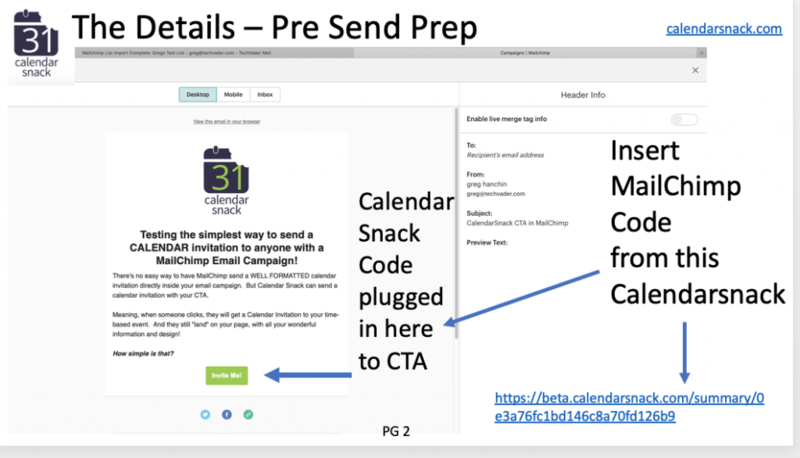 The calendar event payload includes Snack Summary, Invitee Details, Get Code and Send a Test that are auto generated each time by our web service by sending an email to your domain address mail box setup to process the Calendar Snacks. 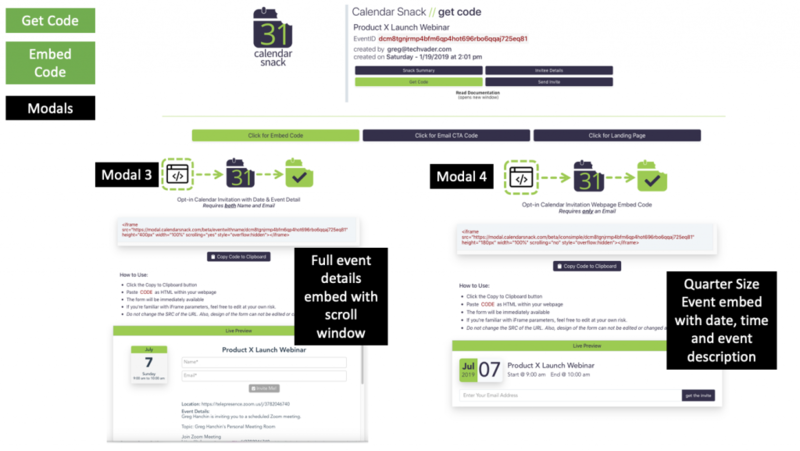 We generate code for each calendar event which is packaged into the Calendar Snack payload. 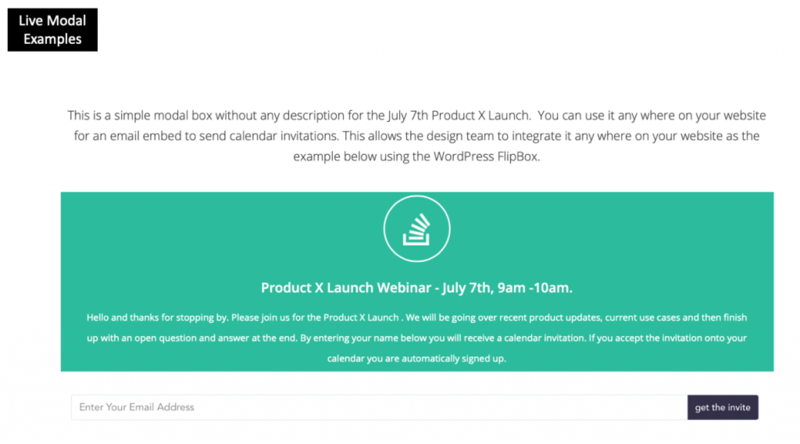 Example of the GET CODE feature for calendar invite web page embed. 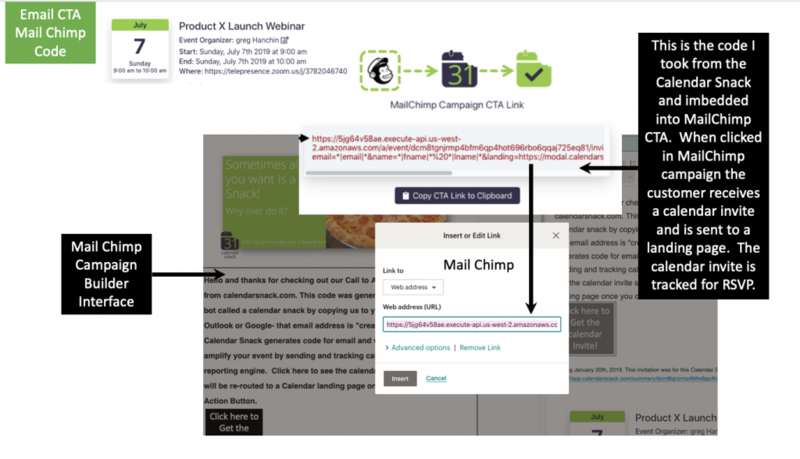 Example of the GET CODE feature for Mail Chimp embed. 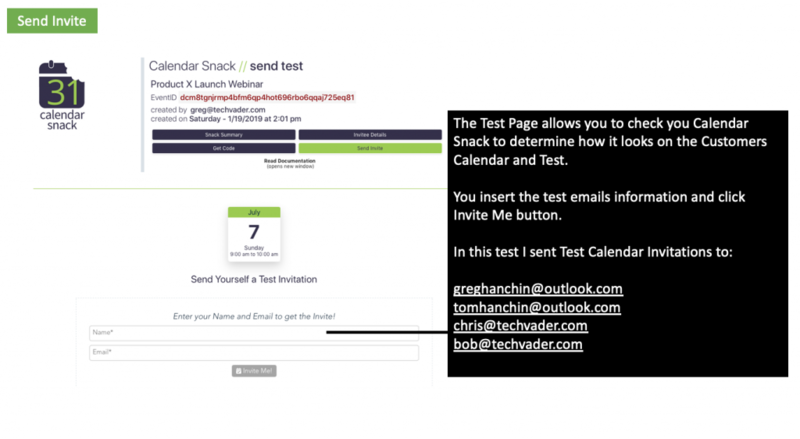 Send a Test feature is included into each CalenderSnack email for a quick review. If you don’t like it after testing the calendar invite, then you can adjust your event on your native calendar client and send another request to get a Calendar Snack. Simple and easy for the marketeer and software OEM to integrate as a service. The entire solution delivery can be rolled out in less than 1 week under your AWS account with your branded domain. We can also manage the solution for you if you don’t have the resources. For details on how easy solution can be packaged see CalendarSnack.com and check out the detailed documentation here. If you have any questions or need a quote please contact us on Drift @ 31events.com. We just released the Support for MailChimp Integration. 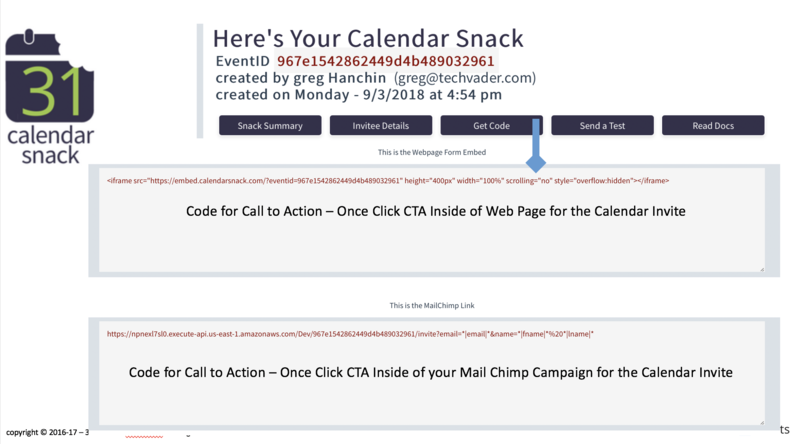 You take the code from our Calendar Snack page by clicking the code button and embed that into your Call to action for one click Calendar Invite signup from your email campaign and we track that for you in the Calendar snack report. This is designed to be free for you to use for any promotion. 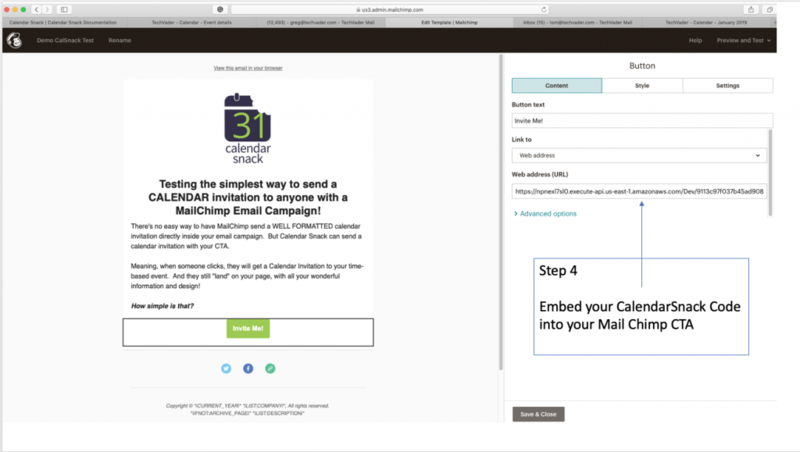 1 Click Calendar Invitations in Web and Email embeds in less than 3 minutes! 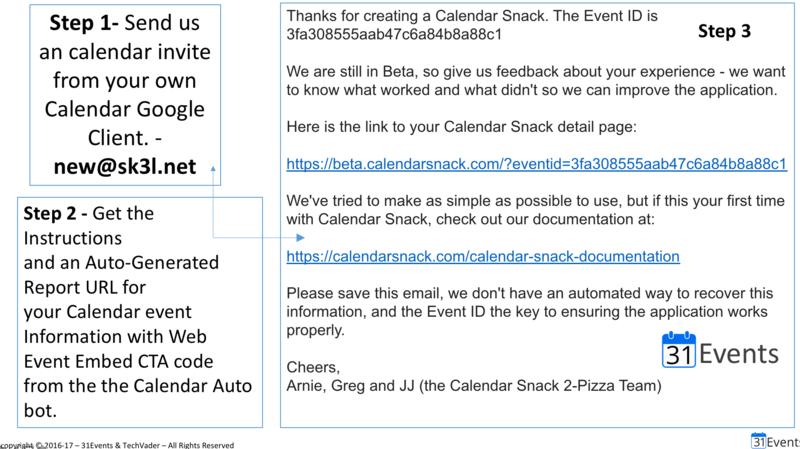 Arnie has updated the front end now to include an auto generated report URL landing page for the Calendar Snack that is sent with the introduction email when you invite us to your event off your Google Calendar. Its simple. Step One – Invite us off your Google Calendar. Step Two – You will receive an auto generated email from our AutoBot (Named Cooper), and the email will have your Calendar Reporting URL in it. Follow the directions and you will be monitoring your event in 30 seconds, PDF Calendar Snacks. ( Thanks Arnie for the Cool Banner – BTW ) . We launched just a few days ago and are receiving good feedback. We are working on the the various embedded Modals for Web page insertion to be auto generated. We have to figure out the hard stuff first and have been busting down the Calendar Clients into smaller pieces using ERE’s and Lambda’s to help accomplish the complicated tasks of the various clients to use calendar create and calendar consumption persona’s for the various devices. In addition we did a recap this weekend of our beta release with some You Tube Video’s that can be found on the CalendarSnack.com site here. 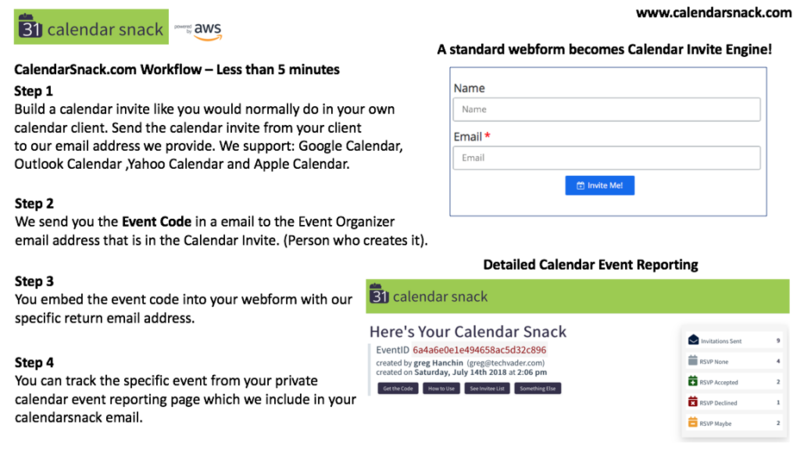 This series is focused on how to build out your own Web Form in Word Press and insert the CalendarSnack Event code into a Calendar invitation form for self enabled invitations off any web property to amp up your attendance. The form allows a customer to send a calendar invite directly to their calendar and we track that for each one off event for the marketeer providing rich detailed big data of the event. Hello – I thought I would get out a quick post and give you and update as of July 15. We completed numerous hurdles this weekend. We have cemented some repeatable install approaches that take less then 5 minutes to get rich reporting working for your calendar invite. 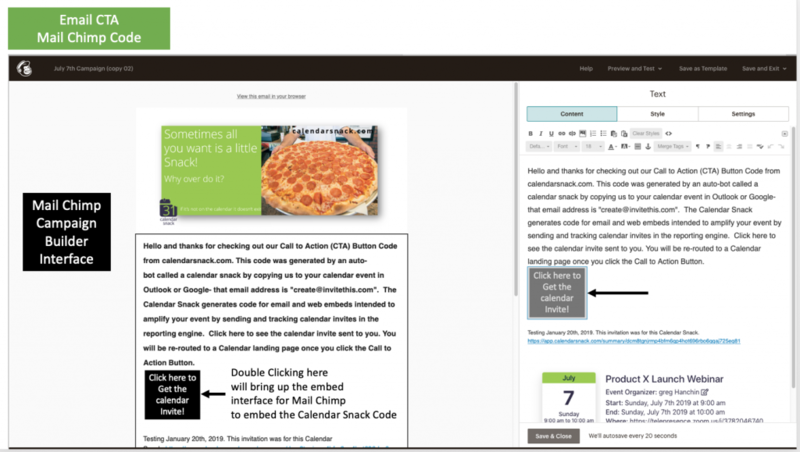 See here to download the preview calendarsnack.com debrief. We will be be launching soon!